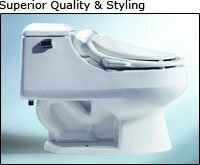 ESB Brain Wave: Best New Product of 2005 - The "Swash"
You walk into your bathroom and sit down on your Swash-contoured and comfortably heated toilet seat. When finished, you simply press a button for a posterior or feminine wash and you are met with a warm, aerated water spray. You can dry yourself with the warm air dryer or pat-dry with a small amount of toilet paper. You leave your bathroom shower-fresh as the gentle-closing lid slowly lowers behind you. Dave Samuel and Scott Pinizzotto, two Silicon Valley vets and co-founders of Brondell, are taking their ideas out of the boardroom and into the bathroom. The San Francisco-based startup recently launched the “Swash”, a high-tech toilet seat that provides all the sanitary benefits of a bidet. The pair is betting the luxury gizmo will blow the lid off a potentially huge, untapped market. Introduced nearly a year ago, the Swash actually replaces your conventional toilet seat to transform a run-of-the-mill toilet into a bidet — a device that cleanses both posterior and feminine regions with a spray of warm water, relieving people from the hassles of toilet paper. The Swash also features heated seats, remote control and warm-air dryer, which eliminates the need for toilet paper. “The toilet is a product that is used by every man, woman and child on earth, and we are going to gadgetize it and make it better,” Samuel vows. But pampering the posterior isn't cheap. The Swash retails for $429 to $549, yet sales have risen by nearly 50 percent every three months. Although bidets are common in Europe and parts of Asia, the high-tech toilets haven't made much of a splash in the United States. But after using bidets while on business trips in Japan, Samuel and Pinizzotto realized they may be sitting on a potential gold mine. They were sure high-tech toilet seats would be a smash in the United States, with some adjustments from Japanese models. “Proportionally, just creating more space for the large American body,” says Pinizzotto. The Swash is already available at Home Depot, Bed Bath & Beyond, and many other home furnishing stores. As part of Brondell's agreement with Bed Bath & Beyond, a demonstration video will be placed near the product display in order to educate wary consumers. Test driving the Swash is not yet available. Investors are taking notice. Billionaire Mark Cuban recently joined the board of directors after his $1.3 million investment. “The team has developed an innovative approach that targets a massive market which has seen little innovation in the last 250 years” said Cuban. Until then, Samuel and Pinizzotto may have to sit and wait.